The villas at Villa Park Eden Club are spread over a slightly rolling terrain and all have a garden and terrace facing southwest. Our villas are detached and comfortably furnished, with a lovely living room with sliding doors to the terrace. In the garden you'll find a private swimming pool (in the summer) and a sun terrace with four sun beds. When you hire a baby bed, you can also request a baby bath, a changing pad and a bottle warmer. 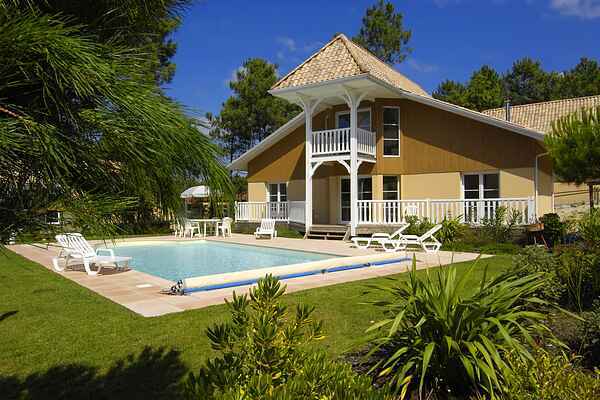 Villa FR-33680-15 (6-8 people) has a bedroom with an en suite bathroom on the ground floor. For type FR-33680-16 (8-10) there two bedrooms with a bathroom on this floor. There is an extra bathroom on the first floor. Both homes have a washing machine and dryer.